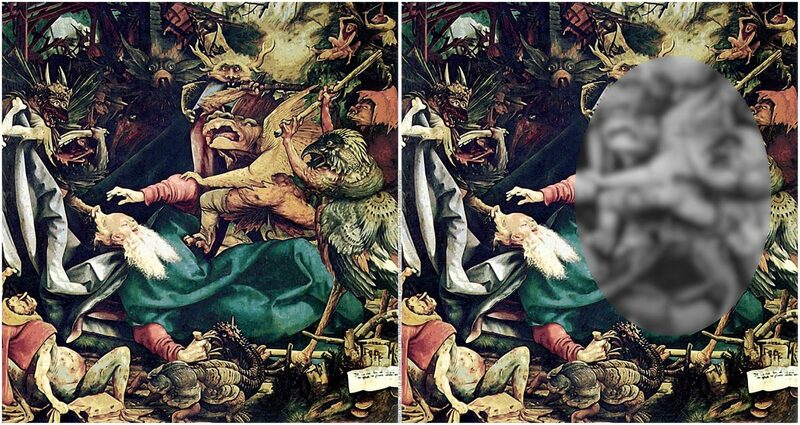 Two renderings of a segment from Matthias Grünewald‘s The Temptation of St. Anthony (c. 1512-1516, painting in a panel of the Isenheim Altarpiece), where a part of the rendering on the right side has been low-pass filtered and decolorized. Drapery gives a lot of freedom to create various kinds of shapes. 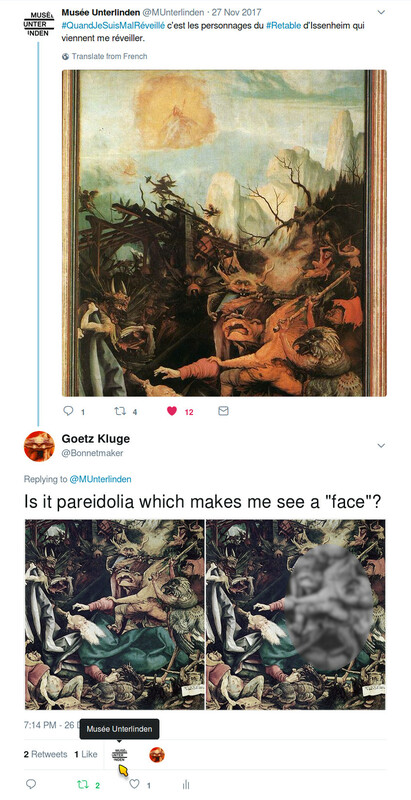 Grünewald made use of that. Henry Holiday played with drapery too. Bruce Poulsen (2012-07-31). For artists and writers, the reasoning even may be not faulty at all. They instrumentalize their own and their audience’s apophenia. It’s fun, as long as you don’t suffer from it. However, in the audience there may be discussions about what the artist intended. That’s adds to the artist’s fun with his work. For comments: Twitter 1 | Twitter 2 | Twitter 3 | Reddit | Facebook | Instagram | Ipernity. By the way: http://thefugitivesaint.tumblr.com/tagged/Saint+Anthony/ is a great collection of artwork depicting the Temptation of St. Anthony.